Sustain Our Local Orchard – United Community Partners, Inc.
United Community Partners is proud to join the campaign to Save Eagle Creek Orchard. Rob and Linda Cordtz have been stewarding the orchard land for nine harvests. This March frost took 70% of the crops. One more season without upgraded frost protection equipment and we may lose the orchard. Greetings, we’re Rob and Linda Cordtz, the owners operators of Eagle Creek Orchard, in Richland, Oregon. Rob comes from a background in Mine reclamation, Linda’s background is retail. At age 52, we left our home in McCall, Idaho of 25 years for a working retirement at the orchard. In 2005 we purchased a conventional orchard which we immediately converted to organic management techniques and got certified by Oregon Tilth. It’s a thriving business which builds and grows each year, this is our ninth harvest. This spring an unseasonably warm spell in March brought the trees out of dormancy and into full bloom early, then a cold front moved through the North West US, temperatures dipped well into the low twenties. 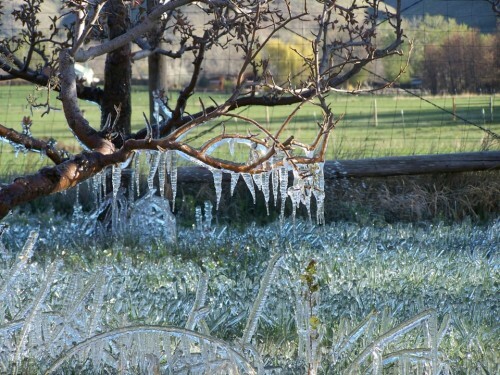 This hard frost killed 90% of our apricots, peaches and plums. This event equities to a loss of more than 70% of our total yearly harvest and income for 2013. Up until this spring, our frost protection equipment has adequate to handle the weather, as we are now seeing global changes, wild swings in weather are occurring. Rob and I worry that we could lose the ability to farm this orchard if we experience another killing frost next year. Share things when any of us post them to your facebook (just hit SHARE) – but also add language as to why this matters to you! UCP is assisting with the social media campaign to spread the message far and wide to aide in reaching Rob and Linda’s fundraising goal.